Over five years ago I wrote a piece to perform on the Drink at Work Show. It was about my dad giving me the horrific fatherly advice: "Don't fu*k!" in front of my date "Nick Quivers". Thankfully his blunt words were in ASL which Nick did not know. In the piece I described my date as "a tall, deeply tanned eighteen year old decked out in tight acid wash jeans and a turquoise wife beater. 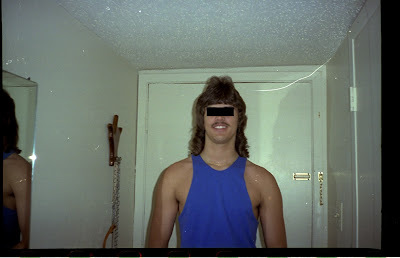 He had a sparsely populated moustache and carefully crafted mullet, his bangs perfectly turned under by a curling iron." I put Nick's name in quotes because that's not his real name. I used his real name when I posted the story on this blog not really thinking much of it. Nick was just a boy and an ancillary character. He could have been anyone and Dad would've freaked out in that moment. Within a few days of posting the blog, I was surprised and excited to see an email in my inbox from none other than Nick Quivers. It had been almost 20 years since I'd last seen him! But my excitement quickly faded. Nick was angry with me. I was horrified. I had told a funny story of my father and, yikes, I didn't mean to upset anyone. What had I done or said in the post that could so have offended him? In sum, he objected to they way I described his clothing & hair. He said something along the lines of, "I never used a curling iron on my hair!! And I have NEVER worn a wife beater!" It turns out, he's now a contemporary Christian rock star and didn't like his old, not so Christian self being drug out of the closet in story about a criminal. I dunno. What I do know is that I was really annoyed that I didn't have a single picture of him to reference. Had my memory failed me? Was I THAT far off? I've always had a pretty spot on recollection of events and conversations. I kind of pride myself in it. So maybe he didn't use a curling iron, but he curled his bangs under with something. I just knew it. But I decided to stand by my blog -- I was telling it how *I* remembered it, and we all tend to remember events differently. So I just changed his name. Fast forward five years later. The last few weeks, I've been working on cover art and photos for my memoir, LOVE, DADDY (Random House). I combed through hundreds of photos and negatives and lo and behold, ladies and gentlemen, I give you NICK QUIVERS EXACTLY* HOW I DESCRIBED HIM! *Well, the black box wasn't over his eyes. Gotta protect his image, ya know. Pfft. And the tank is more of a blue than turquoise, but still. Twenty years had passed since that date and I remembered it as vividly as my breakfast this morning. Also, it is easy to see why Dad stepped in so urgently to warn me of the dangers of teen pregnancy. Nick was a tall drink of dirty water. This is hilarious. I'm glad you found this photo and yea, it does look like he used a curling iron. It's also not hard to understand why your dad had signed "Don't F*ck!" The kid looks like trouble, huh? Dad was probably right to be wary. Heh. This is great! I hope you emailed him the picture.